Since the dawn of civilisation, humans have tried to organise the day by the motion of the sun, moon, and stars. Shadow clocks, better known as sundials, were invented by the Greeks and Romans, and were used by explorers during the age of discovery, and played a fundamental role in finding local time. As watches were notoriously unreliable, sundials were utilised to accurately determine the time - by pointing the triangular style (gnomon) with the number twelve due north, the style will point at the sunny hour. 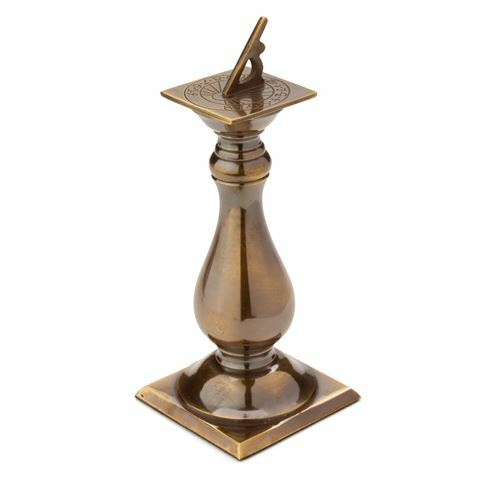 Made from bronzed metal with a polished finish. Felt base protects your table surface from scratches. Beautifully presented in an Authentic Models gift box. Dimensions: 12cm (h) x 5cm (w) x 5cm (d).